It’s raining, it’s pouring, the old man may be snoring, but I’m not! Last night I was awake in the middle of the night and then was overtaken with low-level anxiety. I tried my best to think about pretty things (roses, teacups, crystal vase) or God instead of to-do lists, worries about things I can not change, and being hyperalert to sounds in the house. I remembered an NPR Fresh Air interview with Terri Gross and performer Jay-Z (Beyonce’s husband). Terri questioned him about his insomnia. He said he didn’t like talking about it because that would give it more energy. I thought about how awful it would be to have insomnia and then wondered if this was the beginning of that condition for me! Many minutes went by. Those pretty, loving thoughts were on a slippery slope made all the more slippery because it was raining hard last night. The anxiety side was winning out. I remembered another Terri Gross interview; this one was with a sleep specialist. He said if you wake up in the night, read for ten minutes and you’ll get sleepy again. 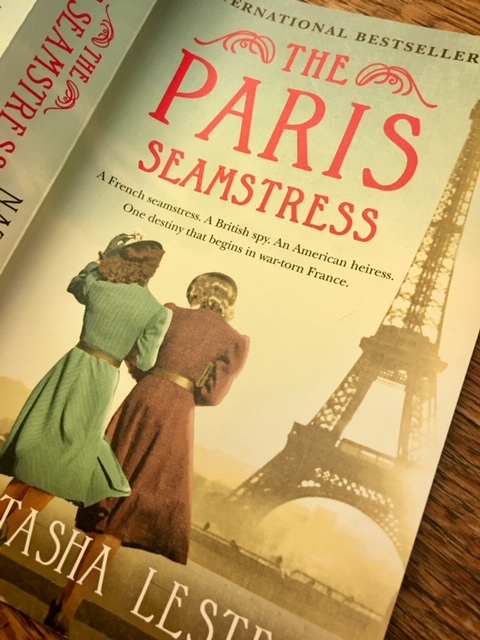 I turned the light on, hunted down my reading glasses and the book The Paris Seamstress by Natasha Lester. Russ gave it to me at Christmas; this was as good a time as any to start reading it. I think it worked. I started yawning and turned the lights out again. It wasn’t instant, but I did fall back to sleep. I was so happy when the morning came. That to-do list seemed manageable, the worry over things I had no control over was hushed. I got dressed (my happy place) and headed to Marin to see our client. But before that, I had one short appointment. I was taking the elevator down in a three-story office building, and a gentleman jumped in with his umbrella and joined me. He opened it up once we were outside so I could see it…plus, it was raining. Little did he know he was talking to an Instagram person and all of you! I couldn’t wait to share this tip. I wished I had time to swing by Big 5 Sporting Goods to pick one, two, or three of them up before getting to my client. But alas, my hat would have to keep me dryish until then. We had a great time with our client who looked out the window every once in a while to see if her house was going to flood. Yes, folks, it’s raining that hard! I got on the freeway to head home and hoped there wouldn’t be any flooded roads. There weren’t. In fact, all the hype about this fierce storm seemed to keep people off the roads. While driving, I played a game with myself, thinking about songs that had “rain” in them. Oh boy, there are some good ones! I’ll leave you with a few of my favorites from our musical past. So here are a couple of questions for you. How do you keep from losing umbrellas? Where do you store your umbrellas? Where do you buy umbrellas? And most importantly, which one of these songs are you singing right now? 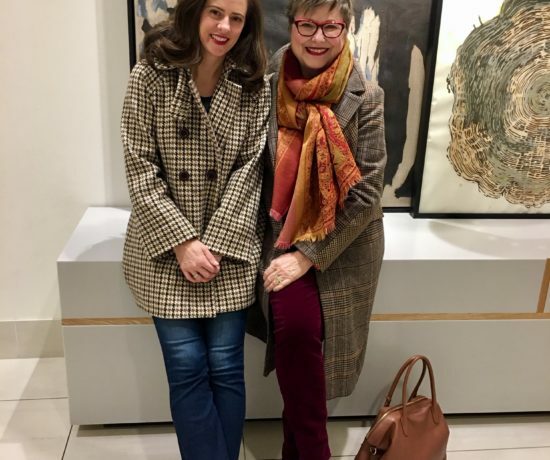 Shopping with Girlfriends — a good thing? How soon can you wear that? I never carry an umbrella in Wintertime, since I always have a hood or hat or beret to protect me. In Summertime, I carry a vary small foldable cheapo umbrella I once found at Primark in London for 2 British pounds (really!) and somehow managed never to lose – a feat for me. Actually, I hate umbrellas, they are cumbersome and losable (is that even a word?!?) and you never know where to put them when they are wet – but sometimes, they can be very useful indeed. That is such a great idea!! You’ll have to thank him for me if you ever see him again!! “The Rain, The Park and Other Things” by the Cowsills, I think… I have a Mary Poppins umbrella that I pretty much guard with my life (ha!) so It’s not likely to get lost. Never did like umbrellas until I got that one. But the gold umbrella is a great tip!!!!! Bobbi – You just brought back a great memory for me. “The Rain, The Park and Other Things” was the FIRST “45 record” I purchased. Played it on my record player with the baby blue case over and over and over …….. I think I may have worn out the record!!! Ha!!! Of course I knew EVERY word to the song. Thank you for sparking a fun memory!!!! I keep my umbrellas in the car so I’m never caught out without one. I have a large folding golf umbrella in my trunk that I bought YEARS ago at Tuesday Morning. More recently, I picked up a cute, brightly colored polka dotted umbrella that’s small enough to tuck into the compartment on my car door and fits in my purse as well. It’s so handy! I mostly use the tiny one now and save the large one for when I’m with someone who doesn’t have their own umbrella or when it’s raining really hard for better coverage! As a young working gal in NYC, I learned quickly one never tries to navigate busy city streets with a large umbrella! My tote bag always held a small Totes umbrella. Life moved on & I worked the last 25 years as a librarian. Carrying a tote bag full of books & an umbrella was a challenge so I bought a LL Bean storm coat with a removable hood and liner. Perfect rain, snow protection. Last year I moved to a golf community in the California desert & I’m so happy I brought that coat with me! Who knew it rained so much in the desert? Love your umbrella tales, Linda! Gosh, I’m thinking about the last time I walked the busy streets of NYC and how impossible a big umbrella would have been. I do have a very casual raincoat that I can wear when walking in the rain. Just remembered it’s in my coat closet. What I need is one that looks nice over my work outfits. Glad you brought that coat too!!! Welcome to rainy-this-year California! Washington DC Metro weather means umbrellas pretty much year-round, but even with that as a given, 2018 was one of the rainiest years ever. So far 2019 is shaping up about the same. As a result there are currently 8 folding umbrellas and 2 golf umbrellas residing in our front-hall closet. Another folding umbrella lives permanently in the car, just in case. Additionally the are 2 Japanese cotton/lace sun umbrellas for the summer when DC gets almost tropically sunny and hot and we need to carry our own shade around. Umbrellas almost by definition get left behind, forgotten, and lost–that’s why we have so many. Carrying one in a tote bag cuts down on loss, so I don’t go in much for big golf umbrellas. My husband used to use a golf umbrella when walking our dog, although the dog, a retriever, didn’t appparently much care about getting wet! Mostly I buy small umbrellas at TJMaxx or Marshall’s, which have great selections of name-brands at very reduced prices. Do those stores in California regularly carry umbrellas, though? Maybe this year, since I know you all have been deluged this winter. Love that line from the poem! What I love about reading your comment is the bounty of umbrellas. I am currently living in a scarcity of umbrellas and it doesn’t’ feel good! I think I need to stock up like you have. I’m sure we have them in many stores–I just never think to buy them until I’m in the downpour! 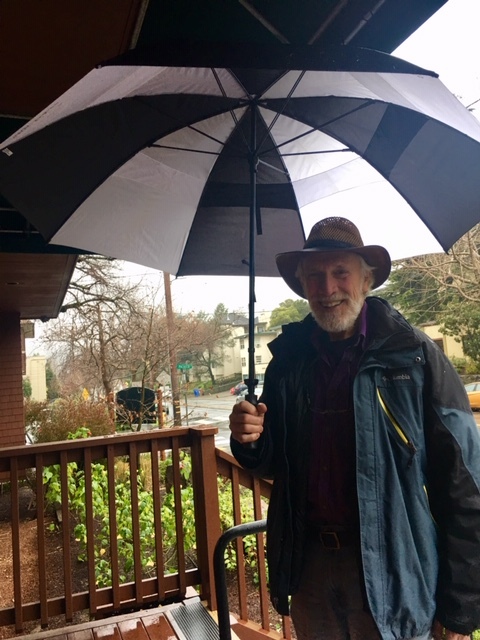 I had to laugh at your “True Oregonians don’t use umbrellas.” People in the DC area use umbrellas when it snows, which seems very odd to me, a transplant from western New York State. Real upstate New Yorkers don’t use umbrellas in the snow! I’m learning things every day! Does anyone wear a raincoat and a contrasting rain hat in Portland? I had a fuschia colored rain hat but I think it’s temporarily lost! How about “Singin’ In The Rain” with Gene Kelly? Thank you for your (and the Gentleman’s) excellent suggestion about golf umbrellas. Wasn’t he such a gentleman? I loved it too! Funny, I think of Singin’ in the Rain more as a movie than a song. I’ve watched it so many times! It’s hard to beat! For me, it’s Elvis in Kentucky Rain. I also enjoy Rhythm of the Rain performed by various groups/artists. My all time favorite umbrellas are the transparent plastic ones with a near-helmet shape. You can hold them close to your head for good protection and see out through the umbrella. They aren’t the most sophisticated, but they’re functional! Now that I live in Maryland, I have a handbag with a mini umbrella in a secret compartment. Growing up in South Dakota, we only used umbrellas as toys. On the rare times it rained, it was a violent storm in the middle of the night! Come to think of it, I don’t think I used an umbrella in North Dakota either. But wow, even in the daytime a storm could come upon you in a flash! Now I want a clear plastic umbrella like you had! I bought my newest umbrella in Singapore. Ladies carry umbrellas most days to block out the sun. Mine is black with mint green lining of a blocking material. It’s noticeably cooler even at noon when the sun is directly overhead. It always stays packed in my carry on. That seems so smart to carry an umbrella in heat. I didn’t know umbrellas would lead to such a rich and lively discussion. Thanks! I usually carry small foldable umbrellas that I get at Marshall’s or TJ Maxx for under $10. But I do have one beautiful umbrella I got at the gift shop at the British museum in London 14 years ago. I carry that when I want to make a statement. I covet your British museum umbrella. Enjoy it for me too! We live in a small rural town. The two high schools are huge football rivals (think thousands in a high school football stadium for the Homecoming game). The cheerleaders sell the big golf umbrellas with the home team and colors on them. I bought one and love to use it if I need to go to the market or be outside on a rainy day! Vicki, I’d LOVE to have a big umbrella from my college football team. Go Bison! Green and gold! That bag is getting so much use these days. 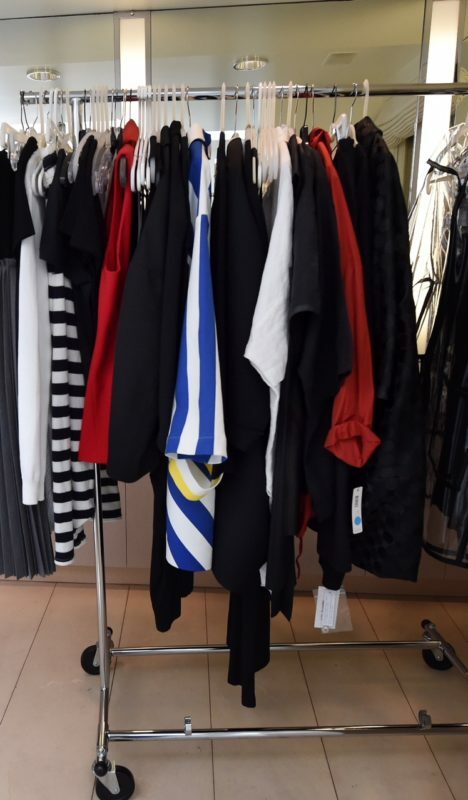 The brand is–just a minute, let me check–oh my gosh, it’s DVF! I bought it on sale years ago at Nordstrom. I LOVED the texture and colors. The base color is dark chocolate brown, the middle is black, that top flap that isn’t really a flap is textured like it’s horsehair but it’s not and then the cobalt blue handles. No more taunting, there you have it! Umbrellas in Wellington, New Zealand, are either brand new or inside out and poking out of rubbish bins. No-one who actually lives here bothers to own one. Nevertheless, I do have a golf umbrella (a promotional gift from someone) that I use while working in the garden when it’s raining but not windy. The weight of it means it stays balanced on one shoulder and leaves both hands free. ‘Bus Stop’, The Hollies (1966). Bus Stop! A great song! Wow, what a great tip about using an umbrella handsfree while gardening. Cool, Laurice! I’m singing “Raindrops Keep Falling on My Head” and “Singin’ in the Rain.” When I can get “Windmills of My Mind” OUT of my mind! Thanks for passing on the umbrella tip. Are you going to tell us about “The Paris Seamstress”? Let me get into the Paris Seamstress some more and I will! My umbrella is always in my car. I rarely catch public transport . I live in Melbourne. Mine is a large golf type one given to me by a law firm! It’s grey. Love the golf shop tip. I had one in my car. My twin brother used it to get into a restaurant and when we left, someone had stolen it. Just hadn’t gotten around to replacing it! I’m loving all the ideas I’m getting! Golf umbrellas are not okay on crowded downtown city sidewalks. Best left for wide open spaces. IKEA is a good source. I buy foldable lightweight umbrellas at Gap Outlet stores, because of the color and pattern selection. Oh, great tip! Thanks. Color and pattern are fun. Let me write that down! So interesting that you wrote about your night anxiety episodes. I have the same thing – sometimes I awaken with such a panic that there’s no way I can go back to sleep! Recently I’ve been consistently awake at 2:30 AM, creating monsters in my mind by rehashing problems or conversations. Like you, I try to think of nice things or pleasant times, but in my darkest hours I simply can’t push the anxious thoughts away. A few pages of a good novel might be a good antidote. It’s just strange that at this point in my life, when I probably have the least amount of things to worry about, that’s what I’m having the most problems with anxiety. Isn’t it just weird? I’ve had pleasant dreams since then but I do remember a time when I was consistently waking up around 3. I started doing some reading after that about sleep. I curbed my screen time and read before bed instead and it got better, much better. Now I’ve slipped into a habit of watching my iPad at night-Netflix. And if I watch something beyond my bedtime, it really messes me up. Either I wake in the middle of the night like that or I simply wake up earlier instead of sleeping in later. I want to do what I did in my 30s! Stay up late, get up early, and manage just fine. We did that, right? How not to lose your brolly? I live on the south west coast of Scotland – lots of rain! If I can wear a coat that has a hood, I will. When I use an umbrella I have a carabiner clip, which I attach to my bag and the loop of my umbrella. By doing this, I never walk away without my brolly when I’ve been sitting in a public place. 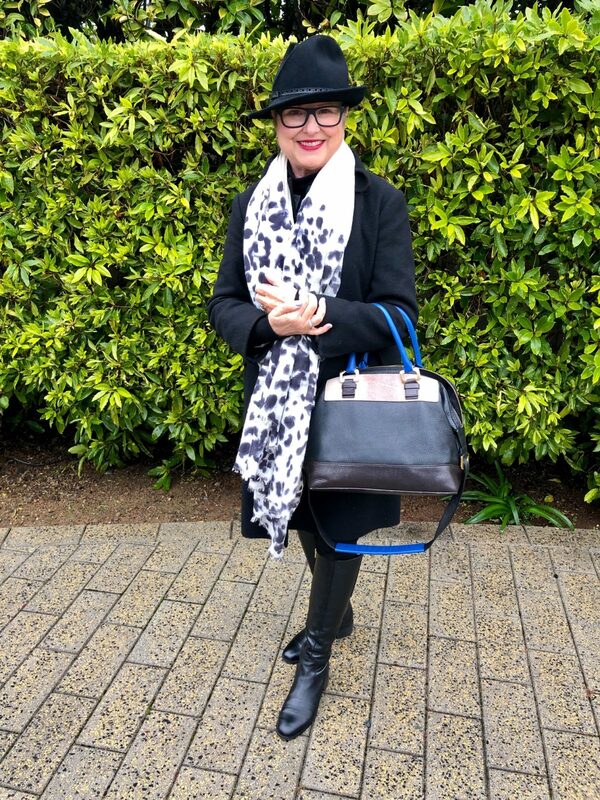 I love your blog Brenda – great writing, and lots of outfit inspiration. Thanks, Gwen for your brolly tips. Wow, I’ve never heard that word before. I LOVE it! Makes it sound like a lovely pet. I appreciate getting the expertise of someone from Scotland! Cheers! Yes, I keep umbrellas in my car and in my home. I get mine free at work with our company logo. But they are small and cheap. In my midwestern city, we drive everywhere and I only need something to dash quickly from my car to building, so usually it’s enough for me. If I find my mind filled with anxious thoughts, whether trying to fall asleep or waking up with these feelings or thoughts, after prayer and Bible reading, I’ll jot down my anxious thoughts. Sometimes putting them down on paper helps corral them, making them less scary and more manageable. Amie, that’s a great tip about anxious thoughts in the middle of the night. Reading this made me remember that someone else mentioned this to me. I bet you’re right. They get magnified in the mind but probably get manageable on paper. Thanks so much!!! I hope I remember this when it happens again. I’ve had pleasant dreams since then, but I know this can come up again uninvited! There’s an old joke about how you need to have three umbrellas: one to leave at home, one to leave at work, and one to leave on the bus. Strangely, you can buy Totes umbrellas at Michael’s (craft store), at a very good price if you have a 50% off coupon. Now that’s a place I wouldn’t have thought of shopping for them! Thanks for the tip. Now, where do I get that coupon?! That’s a song I’ve filled my car with (and me singing along) when no one else was there with me! Thanks, Trinnie. Love from Sonoma!